As a former astronaut and engineer, Julie Payette is a perfect role model for Canadian women pursuing STEM careers. Now the 53-year-old Montrealer has also been named Canada’s 29th Governor General. It suffices to say that Ms. Payette has taken a fascinating path to become the Queen’s next representative in Canada, and one that makes her exceptionally qualified to take on this role. 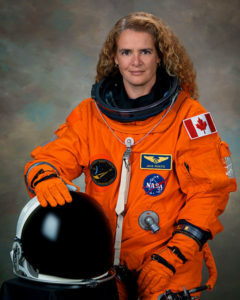 From 2000 to 2007, Ms. Payette was chief astronaut of the Canadian Space Agency. During this time, she worked as a capsule communicator (CAPCOM) at Mission Control Center where she supervised the communications between ground controllers and astronauts in flight. Like everyone across our nation, Canada 2067 is overwhelmingly thrilled to welcome Ms. Payette as our new Governor General, especially given her accomplished STEM background.